T. d. var. aphrodisiaca (G.H.Ward) Urb. Turnera diffusa, known as damiana, is a shrub native to southern Texas in the United States, Central America, Mexico, South America, and the Caribbean. It belongs to the family Passifloraceae. Damiana is a relatively small, woody shrub that produces small, aromatic flowers. It blossoms in early to late summer and is followed by fruits that taste similar to figs. The shrub is said to have a strong spice-like odor somewhat like chamomile, due to the essential oils present in the plant. 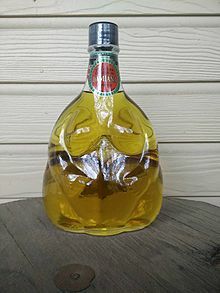 Damiana is an ingredient in a traditional Mexican liqueur, which is sometimes used in lieu of triple sec in margaritas. Mexican folklore claims that it was used in the “original” margarita. The damiana margarita is popular in the Los Cabos region of Mexico. Damiana was included in several 19th-century patent medicines, such as Pemberton’s French Wine Coca. The leaves were omitted from that product’s non-alcoholic counterpart, Coca-Cola. Damiana contains damianin; tetraphyllin B; gonzalitosin I; arbutin; tricosan-2-one; acacetin; p-cymene; β-sitosterol; 1,8-cineole; apigenin; α-pinene; β-carotene; β-pinene; tannins; thymol; and hexacosanol. In total, 22 flavonoids, maltol glucoside, phenolics, seven cyanogenic glycosides, monoterpenoids, sesquiterpenoids, triterpenoids, the polyterpene ficaprenol-11, fatty acids, and caffeine have been found in the genus Turnera. As of 2006, damiana’s constituents have not been identified for their effects attributed to the whole herb. Damiana’s anxiolytic properties might be due to apigenin. The extract from damiana has been found to suppress aromatase activity, including the isolated compounds pinocembrin and acacetin. T. diffusa is a host plant for the Mexican Fritillary (Euptoieta hegesia). Viable plant and seed material sold as T. diffusa from both private and commercial sources largely turns out to be misidentified Turnera ulmifolia (a.k.a. “False Damiana”), a closely related species. This widespread issue has been noted by the scientific community, and has created much confusion among both amateur and professional horticulturists alike. While T. ulmifolia is similar in appearance, its chemical constituents and ethnobotanical uses are distinctly different. Mature stems of T. diffusa are woody, with small, grayed green leaves 13 to 16 mm long, 4.5 to 5.5 mm wide, obtuse at the apex, and strongly aromatic when crushed. T. ulmifolia is differentiated by herbaceous stems, larger blue-green leaves that are strongly dentate with a pointed apex, and only weakly aromatic. One scientific study however, demonstrated this confusion being mostly associated with horticultural commerce, and does not extend appreciably to commercial herbal products, most of which exhibit constituents that can be definitively traced to T. diffusa. ^ “Turnera diffusa“. Integrated Taxonomic Information System. Retrieved 2011-01-29. ^ a b c “Turnera diffusa“. Germplasm Resources Information Network (GRIN). Agricultural Research Service (ARS), United States Department of Agriculture (USDA). Retrieved 2012-01-03. ^ “Turnera diffusa“. Natural Resources Conservation Service PLANTS Database. USDA. Retrieved 12 December 2015. ^ Everitt, J. H.; Dale Lynn Drawe; Robert I. Lonard (2002). Trees, Shrubs, and Cacti of South Texas. Texas Tech University Press. p. 208. ISBN 978-0-89672-473-0. ^ Gildemeister, Eduard; Friedrich Hoffmann (1922). Edward Kremers (ed.). The Volatile Oils. Volume 3 (2 ed.). Wiley. p. 183. ^ Perry, Charles (2007-06-20). “The unexpected thrill”. Los Angeles Times. ^ Pendergrast, Mark (2000). For God, Country, and Coca Cola: The Definitive History of the Great American Soft Drink and the Company That Makes It (2 ed.). Basic Books. pp. 24–30. ISBN 978-0-46505-468-8. ^ Kumar, Suresh (February 9, 2005). “Anti-anxiety Activity Studies on Homoeopathic Formulations of Turnera aphrodisiaca Ward”. Evid Based Complement Alternat Med. Hindawi Publishing Corporation. 2 (1): 117–119. doi:10.1093/ecam/neh069. PMC 1062162. PMID 15864356. ^ Balch, Phyllis A. (2002). Prescription for Nutritional Healing: the A to Z Guide to Supplements (2 ed.). Penguin. p. 233. ISBN 978-1-58333-143-9. ^ Szewczyk, K; Zidorn, C (2014). “Ethnobotany, phytochemistry, and bioactivity of the genus Turnera (Passifloraceae) with a focus on damiana – Turnera diffusa”. Journal of Ethobotany. 152 (3): 424–443. doi:10.1016/j.jep.2014.01.019. ISSN 0378-8741. PMID 24468305. ^ Wauer, Roland H. (2004). Butterflies of the Lower Rio Grande Valley. Boulder, CO: Johnson Books. p. 128. ISBN 9781555663476. ^ Joshi, V.C. ; Rao, A.S.; Wang, Y.H. ; Avula, B.; Khan, I.A. (March 2009). “Taxonomic Clarification on Turnera diffusa Ward and its Demarcation from “False Damiana” using Fluorescence, Scanning Electron Microscopy, HPTLC and UPLC”. Planta Medica. 75 (4). doi:10.1055/s-2009-1216454. ^ “Damiana – Turnera diffusa, Turnera ulmifolia seed pictures”. shroomery.org. Retrieved 7 September 2016. ^ “Turnera diffusa var diffusa or var aphrodisiaca or what?”. National Gardening Association. Retrieved 7 September 2016. ^ “Tropical Plant Database”. Raintree. Retrieved 7 September 2016. ^ Meerow, Alan W.; Ayala-Silva, Tomás; Irish, Brian M. (December 2010). “Turnera diffusa ‘Luisa’, a Drought-tolerant Small Shrub for Warm Climates”. HortScience. 45 (12): 1895–1896. doi:10.21273/HORTSCI.45.12.1895. Retrieved 7 September 2016. ^ “Elm-leaved Turnera – Turnera ulmifolia”. A Neotropical Savanna. Retrieved 7 September 2016. ^ “Turnera Ulmifolia”. College of Micronesia. Retrieved 7 September 2016. ^ “Woody and Herbaceous Plants Native to Haiti” (PDF). University of Florida, Miami-Dade. Retrieved 7 September 2016. ^ Schäffer, Marion; Gröger, Thomas; Pütz, Michael; Zimmermann, Ralf (July 2013). “Assessment of the presence of damiana in herbal blends of forensic interest based on comprehensive two-dimensional gas chromatography”. Forensic Toxicology. 31 (2): 251–262. doi:10.1007/s11419-013-0186-5. Retrieved 7 September 2016.